Bay Bridge 1 is included in the Fine Art Archives of the Library of Congress. Selection of this trace monotype was made in conjunction with the centennial anniversary of the California Society of Printmakers and publication of the book, California Society of Printmakers: One Hundred Years 1913-2013, Maryly Snow, Editor; Sylvia Solochek Walters, Assistant Editor. 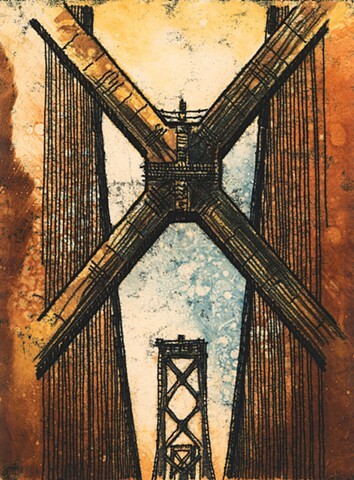 Bay Bridge 1 is shown in a solo exhibition at The Faculty Club of the University of California, Berkeley, Mar 1 - 31, 2011. Bay Bridge 1 is shown in It's Our Nature, an exhibition of printmaking works by the California Society of Printmakers at Thoreau Gallery, The Presidio, San Francisco CA, Aug 10 - Oct 7, 2010.